Come an inch closer to know us better. We at MyAdvo clear all your doubts about the services we provide. From onboarding lawyers to connecting clients with the most suitable one, MyAdvo remains with you all through the process of getting you a solution for all your legal problems. With everyone wanting services quickly, legal services are such that cannot be offered or guaranteed to be quick. This where MyAdvo steps in and changes the game! MyAdvo offers you with a platform for legal consultations, advice and lawyer discovery instant. Acting as a legal concierge, MyAdvo provides you with an extensive list of details and information on lawyers near you. In order to resolve your legal problems, MyAdvo educates you on legal terms, raises awareness on the several Indian Laws and Regulations for a better comprehension of your case and understanding of the legal processes in India. The function and processes at MyAdvo are set apart from other legal platforms services, as your case is given constant support from the case managers at MyAdvo from the beginning of the case until the end. We help you negotiate at a fixed price with the lawyers to handle your case, without any uncertain hike. With a secured end to end services between the client and the lawyer, MyAdvo cuts your effort of running around and aims to offer a trouble-free experience. MyAdvo at present has expanded its horizons to over 60 cities and is spread its accessibility in 500+ districts in India. Till date, MyAdvo has acquired 10,000+ lawyers in the country and has served about 2700+ individuals clients and corporate groups on diverse legal cases. 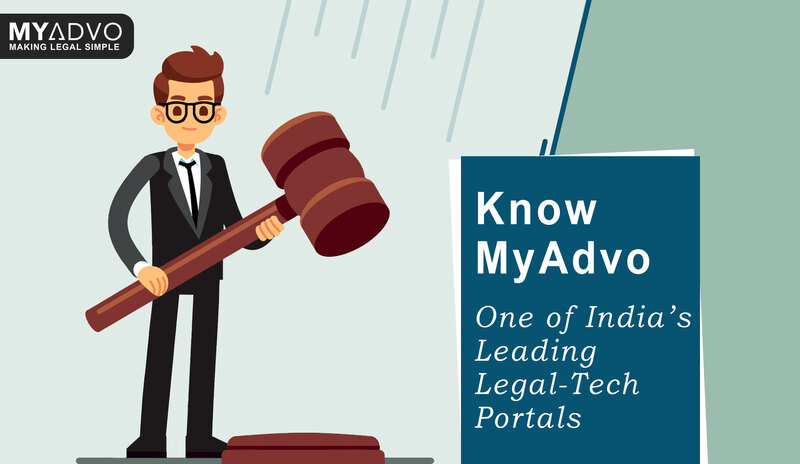 Step by step, MyAdvo is emerging to be one of the leading platforms of legal-tech services in the country. Understanding how difficult it is to deal with legal in India, MyAdvo simplifies the legal processes with a consistent research and brainstorming with some of the experts in law. MyAdvo looks into every detail which can make legal simple for you to use. It presents you with an easy to understand and quick to use knowledge about the Indian Law. With a thorough list of lawyers near you, available to attend your legal needs and issues instantly, MyAdvo makes a great effort to help in choosing the right lawyer for each client. Since every client has different needs, MyAdvo has catered to each one with dedication. Many of our clients have been very satisfied with the way of our working and functioning style, and have given us many positive reviews for bridging the connection, for delivering the legal services, staying with the client till the case proceedings ended. Napolean Hill once quoted, “Patience, persistence and perspiration make an unbeatable combination for success.” and we at MyAdvo try to incorporate the same at every step for our clients and in our work ethics. All you have to do is remember, that at MyAdvo, we make legal simple for you!